The first society garden tour offered seven homes in addition to the grounds of the Maynard-Pearson House in 2005 - gardens of Rosalyn and Bobby Cox, Diane and Allen Long, Helen and Lawrence Long, Rita and Denny Mercer, Deb and John Simmons, Marion and George Smith, and Lise and Joe Zublena.. 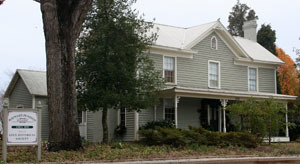 The Maynard-Pearson House dates from approximately 1870 and serves as home to the Apex Historical Society. Landscaping of the grounds is maintained by members of the Society. The goal for the Cox garden is for it to be a place of refuge for bids, squirrels, and any person who needs a place to relax. From an original 48-acre tract, the house, built in 1977, is near the family airstrip and pond. Rich masonry work provides a rich backdrop to the house, pool, and garden. You are invited to come by to see what’s blooming that day, to sit in the gazebo and smell the roses. The three-acre spread the Longs call home is a testament to Diane’s grandparents: To her grandmother who taught her the names of flowers, shrubs, and trees and to her grandfather who turned his wife’s hobby into a business after he retired. Diane treasures plants from his nursery and features them prominently in her garden. Snow Bird, a rambling white rose, is a 100-year-old variety which blooms fullest at Mother’s Day. Diane’s work at Duke Forest in Durham brings her in touch with many older people who loved their gardens; often they ask familiy members to bring a cutting or favorite small plant to share their passion with Diane. She points to these with pride and always gives a verbal snapshot of the giver. When Rita Mercer saw the house at the top of a hill surrounded by tall trees, she was drawn to it with an urgency to have a beautiful yard. As a result of her insatiable interest in plants, she became a self-taught horticulturist and passionate gardener. abundant there when flowering plants become scarce. The path continues through the shaded backyard garden to the sunny Hangar Garden which has become a haven for butterflies, hummingbirds, and Denny’s pilot friends. Rita’s garden contains everything from passalong plants, like Crinum lilies, to rare and unique weeping specimen trees. Small groundcovers abound under massive oak trees. A pallet of soft pastel flowering plants are used in the front garden, while hot colors dominate the sunny Hanger Garden. The landscape has become so much more than envisioned—it is, in fact, a continuing work of art.. If Apex ever had a secret garden, this is it! Nestled compactly behind the house with a manicured front yard is a scene straight from a fairy tale. 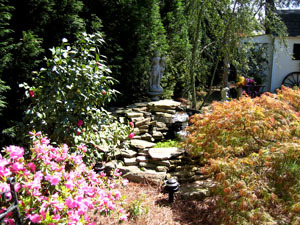 A stone-surrounded water garden is the focal point of the area, with a tiny stone bridge marking the pathway. The tone of the garden is a look at times past — the faux well serving as a planter recalls childhood stories of princesses and frogs. 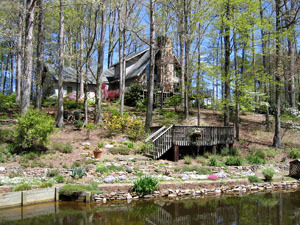 The narrow deck, where Marion sits to enjoy her garden, looks directly over the pond to the lush greenery in the background. Where the house extends beyond the deck, an antique door salvaged from George’s uncle’s house is mounted as a portal to another vista. Just left of the door is the garden shed faced by a wonderful swing, complete with awning. Every available inch of space is filled with wonderful plants and found objects—even an old work shoe. A Lady Banks rose will be filled with exquisite yellow flowers during blooming season. Entering the Simmons’ meandering driveway leads visitors to a boxwood-edged Williamsburg Circle in the front of the house. Evergreen plants form the foundation plantings both there and in the front and side gardens. Fescue around the house gives a live look all year round. A courtyard inspired by home and garden shows in Charleston and Savannah features English boxwoods intermingled with roses to give color. All of the roses are fragrant varieties—Mister Lincoln, Dolly Parton, and a yellow-orange spice. the back side of the courtyard will become just as desired. 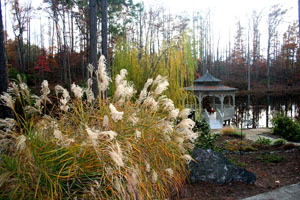 The back and side gardens are highlighted by beds of ornamental grasses. Experimentation has shown that the Zebra Grass is quite tame, while others tend to be too aggressive. Perennials and annuals add additional color to these gardens. The poolside landscaping includes Indian Hawthorne, Palmetto Palms, yews from the NCSU Raulston Arboretum, and seasonal vegetables which are tucked away out of sight of the many deer. Possibly the largest garden on Salem Street, the Zublenas’ is a testament to he generous spirit of gardeners! Beneath many of the century-old trees are mini-gardens featuring plants from many of Apex’s outstanding gardeners. “Pine Forest” garden, and the shade garden boasts beautiful viburnum from Rachel Lewter’s garden. Not content to have their entire garden material donated, Joe and Lise have added numerous plants, including camellias, hosta, and ferns in every area. A round vegetable garden is Joe’s summertime project. The weathervane is a reminder of the Apex fire trucks. Joe’s special continuing garden to the left of the front gate contains many electic plants, including the Weeping Blue Atlas.